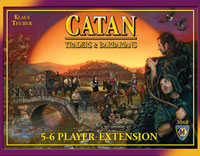 With this extension you can play all five exciting Catan Traders and Barbarians scenarios with up to six players. Now you'll face even more competition from your fellow settlers as you struggle to survive and prosper on the island of Catan. You must have The Settlers of Catan board game and the Traders and Barbarians expansion in order to use this extension. Add a Review for "Catan: Traders & Barbarians – 5-6 Player Extension"